Historically most learning that has ever taken place has taken place in a classroom with a teacher giving instruction and students reading books and writing on paper. Though the 20th century, however, more and more learning has been taking place outside the classroom, using technology to reach students at a distance. For example, Australia’s ‘School of the Air’ used wireless radio transmissions to send lessons to children growing up on isolated sheep stations. [ii] And of course institutions like Britain’s Open University became expert providing learning by correspondence. The first online classes were offered starting in the 1980s and over the last 30 years the internet has been used to offer lessons at all levels all over the world. These new technologies have changed the way educators look at learning. The need to adapt to students working from home and at a distance caused educational institutions to examine their practices more closely. 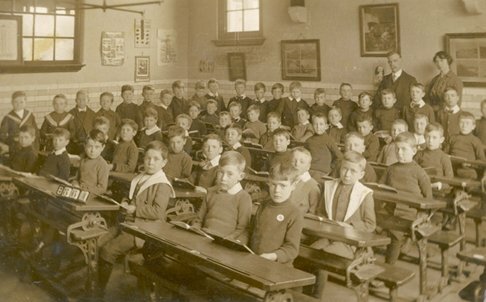 For example, one of the first technological developments was the ‘course pack’. This was typically a package of printed material containing all the guidance that would normally be provided in class by a teacher: lessons, readings, quizzes. Course packs are still used to this day; the Open University offers them online as part of its OpenLearn initiative. [iii] These packs need to be created ahead of time, so their authors had plan every detail of a distance education class ahead of time. As they did so, their understanding of the process changed. The first and most important lesson learned by distance educators concerns the role of the student in his or her own learning. Where students were once thought as passive recipients of learning, today it is understood that they must be willing collaborators in the educational process. And where once it was thought that an education consisted mostly of the facts and data to be remembered, today it is understood that becoming educated is a developmental process, like becoming physically fit. Community - the student may need social engagement to comprehend the implicit and unwritten aspects of a discipline, such as a feeling for what is relevant, ways of observing and approaching problems, and standards for success. When online learning technologies were first being developed in the 1990s their designers sought to incorporate not only the presentation of content and learning materials, but also to support these other aspects of the learning experience. Consequently, learning management systems consisted not only of text-readers and video players but also additional tools supporting the active engagement of students. These systems - with names like Atutor and Blackboard and WebCT (short for ‘Web Course Tools’) sought to encourage student participation by replicating the classroom experience. They included at a minimum discussion boards or online conferencing tools, a conversation or chat area, online exercises and quizzes, personal profiles and activity lists, and scheduled activities involving readings, exercises, interactions and assessments. Through the first decade of the 21st century, traditional learning management systems came under increasing criticism precisely because by emulating the classroom experience online they did not sufficiently support student engagement and participation. 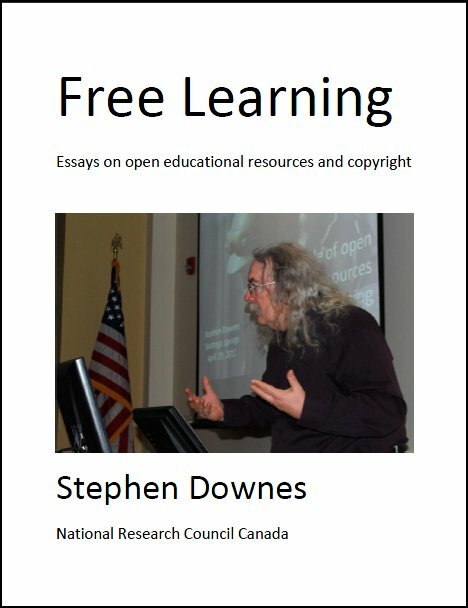 The new models of open and distributed learning described in the remainder of this chapter can be seen largely as attempts to reinforce the student’s active and participatory role in learning, to move beyond what is possible in an online classroom, and to embrace the potential of the wider internet. Today, though, the learning management system (LMS) remains the dominant model for online learning. Virtually every institution along with most large corporations and governments use LMSs to manage training and education. The LMS market is worth $925 million in the U.S. and more than a billion dollars worldwide. [iv] Learning online today means taking a course from an LMS, which means being led through a series of lessons and activities by oneself or with a cohort of classmates. Learning tomorrow, though, will mean something very different as learners and education providers push the limits of the traditional LMS in an effort to make learning increasingly personalized and active. Whether offered through an in-class or distance education setting, one of the central issues of formal learning revolves around its cost. [vi] Savings expected through the use of distance or online media do not materialize due to the expense of course design, formal instruction, and assessment or evaluation. Through the 1990s as well criticisms began to be voiced regarding the formal and inflexible nature of learning management systems. Non-formal learning refers to a type of learning that may still be offered by an educational institution but which does not have a formal credential or certification as an outcome. Non-formal learning may thus be more loosely structured and delivered than formal learning. Informal learning by contrast is not managed by an institution at all, but is rather managed by the individual learner. Consequently, it may be thought of (from an institutional perspective) as lacking any form of organization or objective. Informal learning in particular has received increasing attention because of its relation to lifelong learning. It may be thought of as ‘learning on the job’ or ‘experiential learning’. In particular, learning occurs as individuals make sense of the experiences that arise during their daily lives on the job. It is rooted in a person’s existing knowledge, skills and interests, and often adapted to meet a participant's specific needs. As a result, the development of informal learning systems managed by learners themselves tend to focus less on the presentation of information and the remembering of facts and more on descriptions of experience, discussions about practice, response to requests for advice, and conversations of a more general nature. These systems arise outside the traditional learning infrastructure and often outside learning institutions entirely. For example, self-organizing social systems arise in discussion web sites such as Slashdot and Yahoo Groups. [viii] These are essentially learning communities organized around some topic of interest, whether it be knitting or learning disabilities or bee-keeping. Instead of there being one teacher leading instruction, people ask questions and are engaged by the community. Sometimes an answer is provided, but just as often more questions are asked as people try to narrow the context or reframe the question entirely from a more informed perspective. The principles of informal learning apply to any form of environment where informed and effective action is the desired outcome. Jay Cross, for example, writes about Company Command, an informal learning community developed by two American company commanders who knew each other from West Point. [x] The Company Command website states, “We are a grass-roots, voluntary forum that is by and for the profession with a specific, laser-beam focus on company-level command.” Cross cites some of the very specific advice found in comments on the site, varying from taking off armour in tents to wearing seatbelts in the vehicles. “Every community needs a clubhouse where members can discuss things and draw conclusions,” he says. A major element in the development of informal learning through the early 2000s has been the emergence and development of open learning. The term ‘open learning’ originally referred to “Policies that permit open entry to learning, liberal transfer of credits and recognition of prior learning.”[xii] Institutions such as Britain’s Open University and Canada’s Athabasca University were created in order to offer access to learning without admission barriers by offering distance and online learning, though in a formal mode, with clear learning objectives leading to a certificate or degree. A significant proportion of the investment in open learning is toward the learning materials to be used in course packages and other delivery media. The course packages would be constructed out of reusable modules of digital learning content called ‘learning objects’. Beginning in the late 1990s the development of these ‘learning objects’ and associated infrastructure has become central to online learning. Consequently, open learning has come over time to also be associated with the concept of open access, which is to say, a lowering of barriers to the access to these educational materials themselves. A number of academic and technological initiatives emerged in support of open access. The concept of open access covered not only learning objects but also any resource involved in education, including for example books and journal articles. Open-access (OA) literature is digital, online, free of charge, and free of most copyright and licensing restrictions. [xiv] An early advocate of open access was the Scholarly Publishing and Academic Resources Coalition (SPARC), formed in 1997 by the association of research libraries. The Budapest Open Access Initiative (BOAI) was the first major statement by scholars in support of open access. The first major technological development in support of open access was probably the Open Archives Initiative (OAI, 2011). This project described a set of specifications for the provision of open content through repositories, and included methods for submission, indexing, search and retrieval of content. The initiative was designed primarily for research materials, but its wider applicability to educational materials is apparent. In addition to lobbying and the provision of technological infrastructure, the primary mechanism employed in support of open access, and therefore open learning generally, is open licensing. 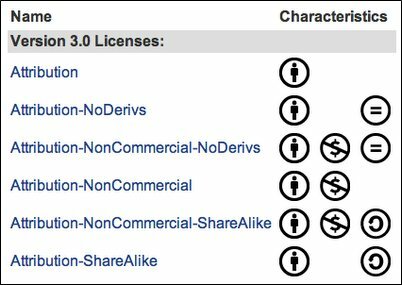 This term may be used to refer to any of a number of licenses that support open access. A core element therefore of open licensing is not merely access to the content in question, but also the ability to share the content thus accessed. Numerous funding institutions have begun to require that materials produced under their programs be released as open access, typically under a Creative Commons license. These open access mandates, as they are known, have been implemented by such agencies as the Wellcome Trust, the US National Institutes of Health, the World Bank, and others. The development of learning management systems, discussed above, led to the development of repositories of learning resources similar to the Open Archives Initiative. These learning resources, called ‘learning objects’, were designed in such a way as to be discoverable, sharable and reusable in learning management systems. Examples of learning object repositories include the Multimedia Educational Resource for Learning and Online Teaching (MERLOT),[xvii] Europe’s ARIADNE project,[xviii] Canada’s Campus Alberta Repository of Educational Objects (CAREO) and Australia’s EdNA (Education Network Australia). 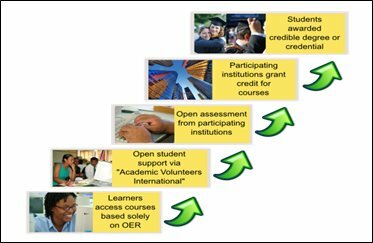 In 2002 the global effort to begin formally recognizing open educational resources began. The term Open Educational Resources (OER) was adopted at a global forum convened to study OERs, and the UNESCO OER project has been active since#[xxi] focusing on research into development, distribution and sustainability, and launching OPAL, an initiative to investigate the quality of OERs. The impact of open licensing over the last decade is that hundreds of millions of high-quality educational materials have been made available without charge to the educational community. In some cases, these resources may be reused or incorporated into course materials. 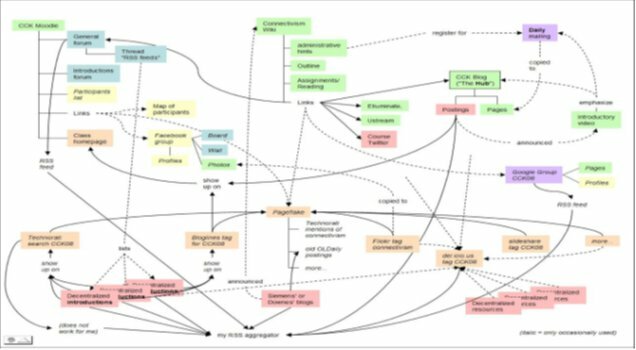 This was the type of use envisioned by the developers of learning object repositories and open educational resources. The resources would become a part of a course package; open licensing was used to allow the resources being adapted into course packages and to allow for resale, if necessary. But the growing ubiquity of web access begged the question: why incorporate materials into course packages at all? Why not just send the student to the resource? This would make many more resources available instantly. Some objections present themselves immediately: questions about the persistence of materials was raised, their quality and provenance, as well as privacy and security concerns. But the possibly suggests new models of online learning, and these began to appear with the articulation of E-learning 2.0. A good example of web 2.0 was the way Flickr worked with other services, such as Piknik. As mentioned above, users uploaded and stored their photos on Flickr. So Flickr was like a big database of photos. But if the user wanted to edit their photo, they could go to a different service called Piknik. Once they logged in and gave Flickr permission, Piknik could access their photo data. The user would use Piknik to edit the photo, and then the photo would be sent back to Flickr, all behind the scenes. [xxvi] Flickr was one of a group of websites - two other notable examples are Twitter and Del.icio.us - which gave users access to each other’s data. This allowed users to use the sites socially - they could share links, information and photos. Because the data was interlinked, these services came to be known as social networks rather than simply websites. Before web 2.0, online services were provided by heavy enterprise programs (like a learning management system) that would access data either locally or using web services to obtain it from other systems. These programs would present that data as web pages, much like a course page that might be viewed on an LMS. After web 2.0, online services began to be provided by lightweight web applications (or ‘apps’) that could access data directly from the source and manipulate it inside the web browser. The concept of E-Learning 2.0 was based on this idea. It merged the idea of the ‘net generation’ learner with the concept of social networks and ‘web 2.0’ developed by Tim O’Reilly. The idea was that individual learners could find and share resources with each other using social networks. For example, they could each create their own blogs and use these blogs to link to photos or videos they may have found on the web. These blogs were saved as data feeds that could be read using feed readers. Thus a student could use a web application, such as ‘Google Reader’, to read everyone else’s blogs. After - students would link to resources wherever they may occur around the web and make these links available to other students; these resources would be viewed individually with no preset order or organization. E-learning 2.0 thus represents an unbundling of educational resources; what was once presented as a single package is now presented as a set of discrete resources. It marked the transition from the World Wide Web as a medium for presenting documents and other static content to the web as a platform for social networking, interactive applications, and communications networks. As noted above, examples of informal learning could be found in communities like Slashdot, Yahoo Groups and content management systems. These communities followed the development of the World Wide Web through the evolution of social networks and web 2.0. Though large and informal, these communities became cohesive and offered substantial value to their members. One example of a distributed social learning community is the “Webheads in Action” community[xxvii]. The Webheads, a community of language instructors, emerged out of online sessions held at the Electronic Village prior to the community’s annual TESOL conference. Eventually some conference sessions were held online as speakers presented remotely using Wimba for voice and Yahoo for webcam broadcasts. By 2004 the community had created its own Yahoo group[xxviii], which was active for about a year. They used a variety of media to collaborate, including a PBWorks wiki[xxix], online chats and more. Another important example is Wikipedia. Most readers will be familiar with Wikipedia, created by Jimmy Wales and Larry Sanger in 2001[xxxii]. It has 22 million articles (over 4 million in English alone) and about 100,000 regularly active contributors. The principle behind Wikipedia is that any reader may contribute to, or edit an article (this process has become more formalized over time). Wikipedia has expanded in other ways as well; the Wikimedia Commons, mentioned above, is a branch of Wikipedia and hosts several million images and other resources. Wikipedia is just one example of a wiki. The wiki has become an alternative form of content management and can be found everywhere from corporate intranets, school divisions, and informal learning. They are a popular way for a learning community to gather and store knowledge and resources. One example of this is the Audacity Wiki[xxxiii]. Audacity is a widely used open source audio editing application. The Audacity wiki is used by the community to share notes and tips about the software. Curricki – “the result of work done for GELC - the Global Education and Learning Community - an online project started by Sun Microsystems to develop works for education in a collaborative effort.”[xxxv] Curricki is focused on K-12 schools and contains about 43,000 resources. WikiEducator – “WikiEducator is a community project working collaboratively with the Free Culture Movement towards a free version of the education curriculum by 2015.” This wiki is focused on offering full online courses in collaboration with participating institutions. The idea is that educational institutions and other collaborators provide free online learning materials, much along the model of Open Courseware. These resources are used to create online courses with learning support and tutoring provided by a network of volunteers. Finally, credentials are provided by accredited educational institutions through some sort of learning assessment. This logic model was used as the basis for OERu, founded by the Commonwealth of Learning with Wikipedia and formally inaugurated by founding partners at a meeting in new Zealand in 2011. Another example employing a similar model is P2P University[xxxviii] which “provides an online space for people to work together to learn a particular topic by completing tasks, assessing individual and group work, and providing constructive feedback." Yet another example is CodeAcademy[xxxix], which provides community-contributed resources helping people learn to write software. Yet another is Khan Academy[xl], which features about 3,000 resources on mathematics and physics. Once again, the model is to offer a set of open and freely accessible learning resources, and then to provide some degree of coaching or tutoring offered by volunteers. customization is provision of mechanisms that allow a user to explicitly state what content they want and how they want it presented. For example, when you narrow a Google search range to ‘Creative Commons only’, that’s customization. The combination of customization and personalization provide some, but not all, of the objectives set by new pedagogies. Students are limited by the capacity of the LMS. Community-formation is limited to the students enrolled in the course. Students can participate and interact, but their creativity is limited by the LMS environment, and they lose access to their work at the end of the semester. Many LMS developers adapted by adding e-portfolio capability. An e-portfolio is a collection of a student’s work presented for display to an external audience, much like the way an artist would collect a portfolio of her work to show to prospective clients. Students can select their best work and customize how the work is presented. LMS vendors began offering e-portfolio applications as extensions to learning management systems. Additionally, open source e-portfolio systems, such as Mahara, were developed for use with open source e-learning software. The idea of the personal learning environment is that it takes advantage of the many sources of open educational resources available on the Web, including not only those available in formal learning repositories, but also those contained in sites such as YouTube and Flickr. In addition, the design of the PLE encourages students to create and contribute to this wider community by creating blog posts and uploading images and videos. Finally, the PLE supports participation in open social networks to a much greater extent than the traditional LMS, for example by reading from and sharing to social network services such as MySpace, Twitter and Facebook. While the PLE is thought of as being based on a particular application, a secondary concept, that of the Personal Learning Network has also emerged, this not being based on an application at all. The idea of the PLN is that a learner uses existing social network applications, the most popular being Facebook and Twitter, and assembles a network of contacts with whom to share educational experiences such as discussions, live chat sessions, and learning resources. Autonomy - because each learner supports and manages his or her own learning environment, PLEs and PLNs support a great deal of individual autonomy, with each learner making his or her decision about which resources to use and what course of studies to follow. Diversity - while an LMS and the resources offered in traditional courses tend to be standardized and formalized, learning networks support a diversity of resources, online learning systems, pedagogical styles and formats, and more. In addition, the members of a learning network will use diverse technologies and resources. Openness - a learning management system is typically a closed environment, meaning that only those with appropriate credentials may access the resources and community, typically by means of a login. A network, by contrast, is formed by means of peer-to-peer communications between its members, which means that any person may join and share resources. Interactivity - in a learning management system, the same content is passed from an instructor to all participants; this content forms the core of the learning, and communications are distributive, that is, from the centre distributed to the whole. In a network, however, there is no centralized content, and consequently communications are interactive, with diverse contents being passed from many distinct sources. Concurrent with the development of e-learning 2.0 and the personal learning environment was the development of a web pedagogy known as connectivism. Coined by George Siemens in 2004#, the term captures the essence of a new model of online learning based on networks and community. As Siemens writes, connectivism integrates some important properties of networks such as chaos, complexity and self-organization. Learning, meanwhile, is a process that occurs within these networks, “nebulous environments of shifting core elements”. Learning and knowledge rests in diversity of opinions. Learning is a process of connecting specialized nodes or information sources. Learning may reside in non-human appliances. Nurturing and maintaining connections is needed to facilitate continual learning. Ability to see connections between fields, ideas, and concepts is a core skill. Currency (accurate, up-to-date knowledge) is the intent of all connectivist learning activities. Decision-making is itself a learning process. Connectivism offers a new model of online learning because it presents a different view of the nature of knowledge and learning themselves. It draws not only on the formal theory of networks but also on recent work in artificial intelligence and neuroscience. Normally we think of knowledge as something that is concrete and discrete. A sentence like “Paris is the capital of France” is a typical example. The meaning is contained in the sentence, it is true by virtue of correspondence or reference to the external world, and ‘learning’ this bit of knowledge is tantamount to acquiring or remembering the sentence that contains the information. But as noted above, educators have come to view learning as more than merely remembering bits of knowledge. Connectivism explains why. The knowledge that “Paris is the capital of France” is not actually contained in the sentence itself. Understanding the sentence requiring understanding an entire language, and understanding the language requires knowing things about thousands of other words, the people that speak them, and the community that gives those words meaning. The knowledge, in other words, is distributed – it doesn’t exist in any one place, but is rather spread out across a network of interconnected entities, whether these entities are words, brain cells, textbooks or computer circuits. The theory of connectivism therefore amounts to this: the knowledge is itself a set of connections in network, a pattern of connectivity. A person cannot simply acquire this pattern of connectivist, it has to be grown through repeated interactions. Learning therefore needs to be active, it needs to be network-based, and it needs to be constituted essentially of interactions between networks of users. In the fall of 2011 Sebastian Thrun, a professor of Computer Science at Stanford University, and Peter Norvig, Director of Research at Google, announced that they would offer an open online course in artificial intelligence. No credit would be offered, but students who finished the course would be issued a Statement of Accomplishment. 160,000 people signed up, and the world took notice of what had become a phenomenon, the Massive Open Online Course, or MOOC. Open Teaching, meanwhile becomes possible when you take the synchronous conferencing application you are using and open it up to visitors from across the internet. The model was pioneered by Alec Couros in his online Social Media and Education class beginning in 2007. [xlii] Sessions were offered using the Elluminate conferencing system (now Blackboard Collaborate) and typically featured guest presenters as well as visitors from around the world. The first MOOC was offered by Stephen Downes and George Siemens at the University of Manitoba in 2008. Originally planned as a small course on connectivism, 24 students signed up for credit. When the course was opened to anyone who was interested, however, an additional 2200 signed up. This large contingent of students helped create some of the innovations that made the course a MOOC, rather than simply a large course online. When the course – called ‘Connectivism and Connective Knowledge 2008’, or CCK08 – was set up, the authors decided to follow an explicitly connectivist model. This meant that thought here would be a start date and an end date with a list of course topics in between, there would be no ‘official’ curriculum. Additionally, the course was designed as a network, with participants encouraged to use their own websites and weblogs and to register RSS feeds with the central course website. An application designed to aggregate feeds and distributed the results as a daily email newsletter, gRSShopper, was incorporated into the course design. 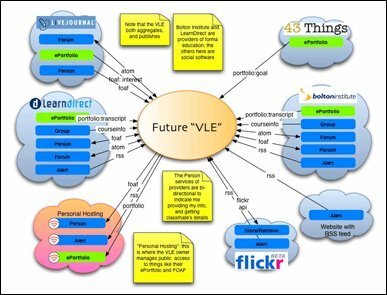 In the upper left of the diagram are the last vestiges of a formal course structure: the structured design of a learning management system, in this case, an open source Moodle installation. Another square structure, at the top middle of the diagram, is the course wiki, on which the planning for weekly course topics took place. The remainder of the structure of the MOOC consists of distributed services linked together by the RSS aggregator: a Technorati search on the #CCK08 tag, a Bloglines harvester, a PageFlakes web portal, Flickr, del.icio.us and Twitter tags, a Google Group, a CCK08 blog, and The Daily, the course newsletter. The second year the same course was offered, a new wrinkle to the model was added. Students returned from the first year, began adding their own materials, and in many ways began to teach the course themselves. This mirrors a phenomenon that was beginning to be seen in traditional classrooms: the idea of the 'Fisch Flip'[xliii] whereby students watch videos, read books, and otherwise receive instruction on their own time, outside of class, and then bring their knowledge and insight into the class, which is focused on students relating these insights to one another in discussions and other activities. Another MOOC of note, offered by Jim Groom at Mary Washington University, was ‘Distributed Storytelling 106’. This MOOC was based on a WordPress blog. Students (and participants from around the world) were asked to submit storytelling assignments (for example: describe a movie in four icons; create an animated image; rewrite a movie poster to reflect a current event). Participants would complete the assignments; these were then aggregated and displayed on the central DS106 blog[xlvi]. The course spawned some innovative side-projects, such as DS106 Radio, a live web radio service created by participant to share their audio projects. The structure of the MOOC was essentially established by these early MOOCs. The course could be as short as 8 weeks or as long as 30. Each week would have its own topic, would be introduced with a set of readings, would involve a guest speaker or host, and would invite participants to add their own resources and build on the comments offered by the hosts. A host web site – very often a wiki, either hosted at an institution website or using a free wiki services; a content management system such as Drupal or Joomla could also be used, or a site hosting service such as Google Sites. A synchronous conferencing environment such as Elluminate, Big Blue Button, WizIQ, Adobe Connect or Wimba. Some MOOCs used what might be called the ‘WorldBridges’ option, broadcasting audio using ShoutCast or IceCast, and video using UStream or LiveStream. In more recent years, Google Hangout has been widely used. An RSS aggregation service – the Downes-Siemens courses used gRSShopper, and thus added an email newsletter to the mix; other courses used WordPress, which has a feed aggregation module, or Drupal, which has the same. Blogging tools, for the participants: recommended services include Blogger, WordPress, EduBlogs, Tumblr, or Posterous. Media upload sites such as Flickr or YouTube. Disscussion boards such as Google or Yahoo Groups; some MOOCs also offered discussion boards through LMSs such as Moodle (but these tended to be less useful with large numbers of participants). Aggregate – though the course hosts might provide a central email newsletter or feed, participants in the course were encouraged to find their own sources and aggregate their own learning materials. As Siemens explains in his Connectivism paper, the decision of what to select is as important a part of the learning process as reading what’s inside it. Remix – this refers to the idea of combining resources from different sources to create a new resource. This could consist either of assembling them in the same environment, like a bricolage, or to meld them into a single new entity, called a mash-up. Repurpose – this refers to the idea of shaping the aggregated and remixed materials into a new form or adapting it to a new purpose. For example, two images might be combined into a single graphic, thus remixing them, and then turned into a cartoon image, thus repurposing them. Feed Forward – this refers to the practice of sharing the new creation with a wider network, most easily accomplished by posting it into a blog, where the blog contents are harvested or aggregated by the course hosts and other participants. Though the design and development of personal learning environments and massive open online courses have caught most of the attention in the online education community, the reality is that the same design and structure can be observed in a wide range of applications varying from corporate communications to arts to fire management. Stamerjohanns, H., & Hilf, E. (2004) The green and the gold roads to Open Access. [xxxi] Edublogs. Website. http://edublogs.org/ See top of the page for the blog count. Views Today: 0 Total: 2731. Last Updated: Aug 20, 2018 5:39 p.m.